Game Of Thrones Season 6 Episode 5 Review: Hold The Door, Please? This season of Game of Thrones has been one smooth roller coaster of fun, accelerating colossally after a less than stellar premiere. Since the slow building first episode, we’ve been hurtling wantonly towards the season’s major stories, with several feel good moments such as the return of Jon, Dany’s Dothraki barbecue, and THAT STARK REUNION. ‘The Door’ gave us a solid mid-season episode that advanced some stories slightly whilst totally ignoring others, ending with a mind blowing final scene which is probably the saddest we’ve ever seen on Thrones. For a brutal show like Thrones, scenes with blood and death and gore, even those involving our favourite characters, are almost guaranteed. And whilst scenes like Ned’s death, the Red Wedding and Jon’s stabbing can and does leave one sad, it mainly gets the blood raging hot, as you fume over the betrayal imbibed in getting our favourite characters killed. The story of Hodor’s death and simultaneous disabling leaves you nothing but absolutely dead inside. I’m still not exactly sure how the destruction of Hodor’s mind occurred, having never been good at the paradoxes and looping circularity of time travel. I’ve checked out the most rabid Game of Thrones online community I know (r/asoiaf), and even though there are several theories, I’m still as confused as ever. At least we now know Hodor’s entire one word vocabulary is due to his being told to ‘Hold the Door’ in the future, his last act before his brutal death that was somehow linked to his past and him getting disabled. As we see here, Bran’s wanton abuse of the weirwood time travelling abilities, which the Three Eyed Crow had warned him about time and time again, is eventually what led to their discovery and the death of almost everyone in that cave except Bran and Meera. 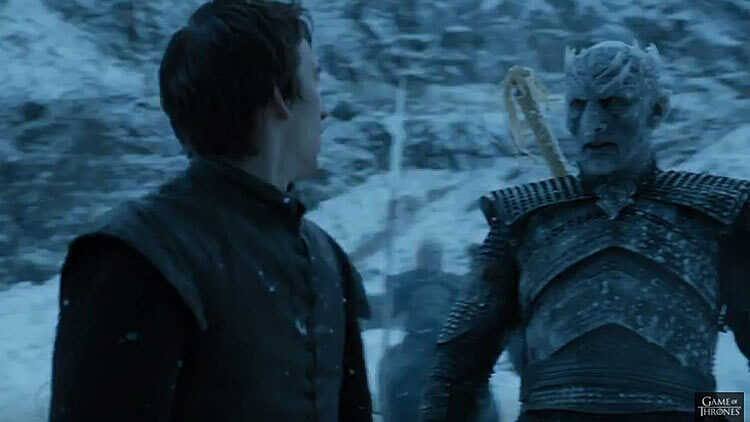 He paid a visit to the Night’s King (the head of the White Walkers), and he saw him, unlike the mere humans in his visions who cannot see him. He marked him, and with that mark they were able to locate their underground refuge and attack it. The Children of the Forest, all of whom died in the attack, were revealed to actually have been the creators of the White Walkers. The Children, those small humanoid creatures littered around the cave, were actually the first inhabitants of the North. They lived there for thousands of years, until the First Men, whose descendants are the Starks and other Northern Houses, came there and started warring with them. They fought for a long time, before building a fragile peace, which was shattered when the Andals, ancestors of the southern Houses, ventured North and also started fighting them. In their desperation, they created the Walkers out of humans, and now they threaten to kill the entire race of man. 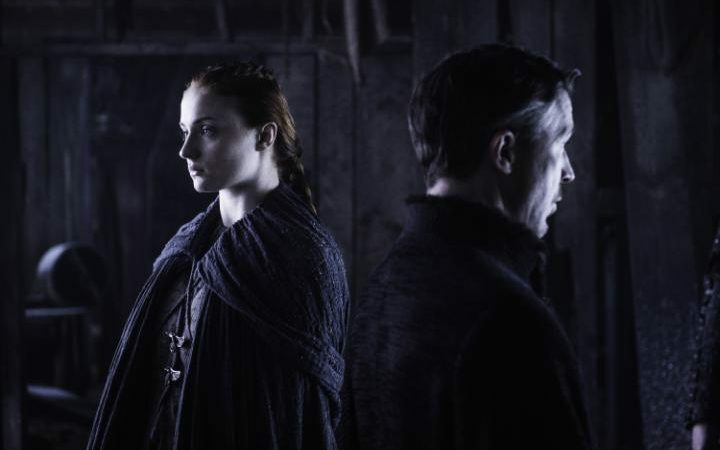 The story in the Three Eyed Crow’s cave this episode revealed a fundamental shift in Thrones policy, from no flashbacks the entire first four seasons, to now venturing unfettered into the realm of affecting the past which then determines the future, in a mind bending time warp sequence worthy of ‘Continuum’ or ‘Interstellar’. Bran warged Hodor in the present, whilst stuck in a vision of the past, which somehow affected past Hodor. 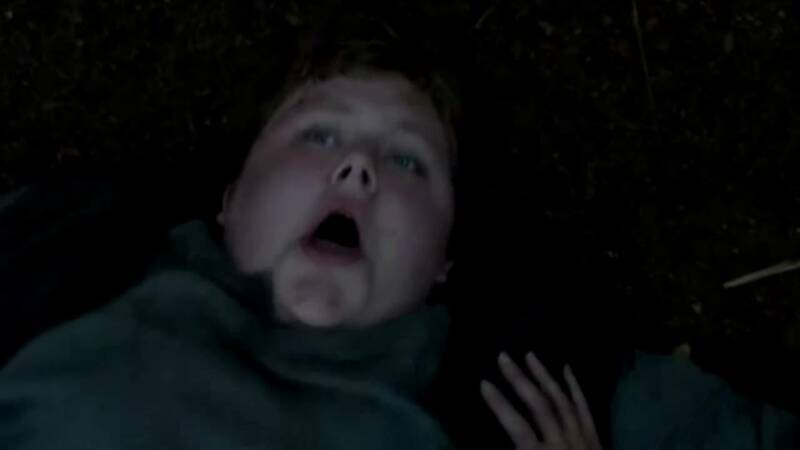 Present Hodor was asked to ‘hold the door’, and he was holding the door as he was being stabbed to death, and somehow that caused past Hodor a seizure, and his mind got destroyed, with the last thing on his mind, and lips, being ‘hold the door’. ‘hold the door’, ‘hold…door’, ‘hodor’. Confusing, but the saddest thing we’ve ever seen on this show. Oh, and Summer joined the dead direwolf squad, meaning two dead direwolves in the last three episodes. So on the direwolf count, only Ghost and Nymeria survives. But ‘The Door’ was about more than just the literal door that destroyed Hodor’s life. The episode opened in the North, with Littlefinger and his Vale army arriving at Moat Cailin, and Lord Baelish leaving for a meeting with Sansa. She was peeved, understandably so, and made the pointed observation that he was either a fool or her enemy, depending on how much he knew about Ramsay before setting her up with him. She was in no mood to hear him out, and in her blind rage made the stupid decision not to accept his help. Stupid, because as we saw a scene or two later, they are seriously understaffed in their upcoming battle against the ‘Warden of the North’, Ramsay Bolton. They need a proper army to take him on, and a bunch of wildlings, and some hypothetical support from Northern Houses not named Umber or Kastark or Manderly -the former two have already declared for Bolton- isn’t going to cut it. But Sansa is pissed at Littlefinger at the moment and therefore won’t accept his support. I suspect Baelish would not give up so easily, and I still think the Vale army would show up at a crucial time to turn the tide of the upcoming ‘battle of the bastards’. We also have the possibility of another Brienne roadtrip, as Sansa sends her away to recruit her great-uncle, Lord Brynden ‘The Blackfish’ Tully to their side. The great warrior (you’ll remember him as the guy who nonchalantly launched the arrow to burn the pyre at the funeral of Catelyn’s dad, after some comically pitiful attempts by Cat’s brother Edmure), has taken back the Tully ancestral home at Riverrun, after being one of the few to survive the Red Wedding. He would presumably ride to Sansa’s aid without hesitation, though the timeline would be a little suspect. Sansa and Jon, meanwhile, would try to recruit more Northern Houses to their side. In the far East, Tyrion continues his rule of Meereen. Whilst the fragile peace they negotiated continues to hold, he fears the people are not aware who brought them that peace. That led to an amazing scene that saw the debut of another Red Priestess, who called herself the first servant of the Lord of Light. Now that might be just a title, but since we know Red Priestesses can be old and hide their true appearances via glamouring, she could very well be, literally, the very first Red Priestess. She pledged herself to Dany, who presumably is the ‘one who was promised’. Varys, our friendly, neighbourhood skeptic, pointed out that another Red Priestess had been calling out long and loud that Stannis Baratheon was the chosen one. 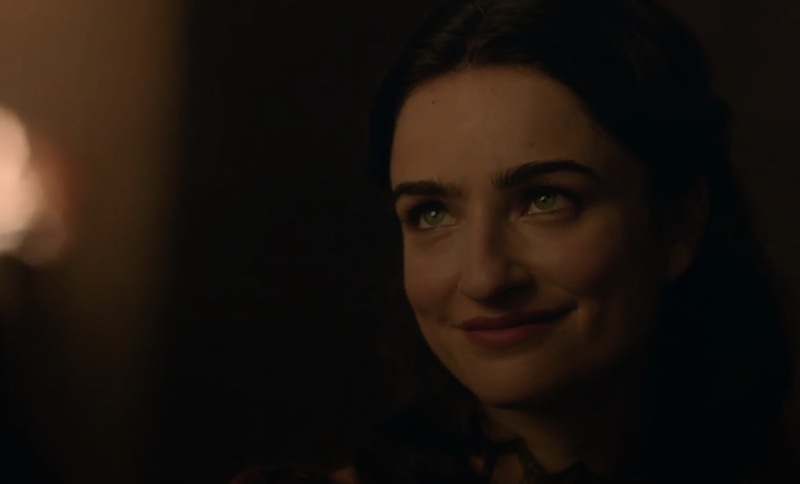 But Kinvara, as our new R’hollor priestess is called, did what Melisandre used to do best; which is use her vast knowledge to put up the facade of being all-knowing and thus stifle questions. Arya’s training continues, and even though she’s still not the best fighter in the world, she seems to be getting a little better; although still not good enough to best the Waif. She gets to go on her first mission since bungling the mission that led to her blindness, and this time, she has to kill an actress who might have incurred the wrath of a jealous fellow thespian. Arya, perhaps still not fully grasping the concept of the Faceless Men, was asking questions about the morality of the action she was supposed to take. The Faceless Men only exist to share what they call ‘the gift’ to others, and their only criteria is that one pays the price, which varies from person to person. Whilst admirable that Arya retains a sort of moral compunction against killing the innocent, if she were truly no-one, she wouldn’t have asked anything. Which points to the fact that she isn’t, in fact, no-one; which I feel should be obvious to the Faceless Men, but somehow isn’t. The temple of Black and White seems like a ruthless place where people aren’t given too many breaks, but Arya seems to be getting them all. Pretty soon, she would have to either go all in as no-one, or escape- because otherwise she should be killed soon. Daenerys, who we merely checked in to see still existed, should be getting herself a fleet soon. The famed Ironborn Kingsmoot occurred, and even though Yara long thought she’d win it, her uncle Euron, who killed her father on the bridge back in the premiere, appeared out of nowhere and snatched the throne from right under her nose. His winning plan, build the largest fleet ever seen, sail it east to Daenerys, and get married to her as an part of an alliance to conquer Westeros. It is a good plan, except Yara and Theon and their supporters dealt it a huge blow by taking much of the existing fleet as part of their escape. The jury is out on where Yara is headed, but it seems likely she’ll try her uncle’s plan for herself, and win Dany as an ally before Euron ever gets to Meereen. ‘The Door’ is perhaps the slowest episode of this season so far, only advancing some plots by mere inches, and giving us a sad, mind numbing, yet eventful ending, as every Game of Thrones episode aspires to. One of the season’s hugest confrontations looks closer than ever, as next week’s preview shows the confrontation between the crown and the faith. The pieces for ‘bastardbowl’ in the north are being placed, and Dany is heading back to Meereen, where a fleet most probably would await her. After five whole seasons, this season just might end with Dany finally leaving for Westeros, just in time for the incoming White Walker invasion. Okine Godwin Nii-Armah is a recent graduate of Ghana’s Institute of Journalism whose two loves are sports and journalism. He writes on almost any topic, but most especially on football, religion, and civil liberties. He is a co-founder of BrutallyUncensored.Com, and a secular humanist who enjoys needling his religious countrymen. He believes no idea should be free from scrutiny, and that those who claim that do so because they know they are holding bad ideas. He is most inspired by three people, Mark Twain, Christopher Hitchens, and Eminem. He believes you can do anything you set your mind to.